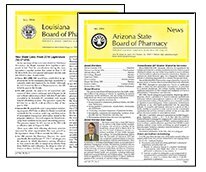 Published on a quarterly basis, the State Newsletters provide pharmacists in over 30 US states and jurisdictions with vital information about their state’s pharmacy laws and board of pharmacy regulations. The State Newsletter Program was created to promote compliance within the practice of pharmacy and is part of the NABP Foundation, which was created by NABP to support the Association’s educational programs and research and development projects. Newsletters are available as free downloads in PDF format by visiting the contact page for each participating board of pharmacy. Over 20 boards offer a free email alert to notify licensees/subscribers when a new newsletter is available. Visit the board’s contact page and click on the subscribe link on the middle of the page to receive these alerts.